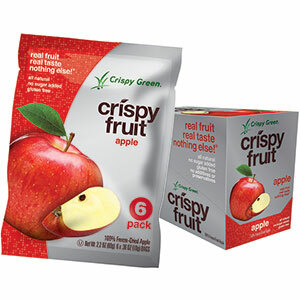 Crispy Green makes freeze-dried fruit that is quite tasty and fun to snack on. These all natural snacks are gluten-free and contain no sugar added. They are crunchy and low in calories. A whole package equal sone serving with only 40 calories! The Asian Pears are my favorite! My children love to snack on Crispy Green, but I wish they were organic. Q. Are Crispy Fruit products organic? A: No, our products are not organic certified. However, they do not contain any skin of the fruit, which is the major carrier of chemical and environmental contaminants. I do disagree with this answer, as the chemicals can and do permeate the skin of fruit. Also, our samples were shipped in a box full of evil styrofoam peanuts, not the compostable kind. My only other concern is this is a product from China. In general, I do not trust food products from China due to contamination issues. I want to assure you that Crispy Green has a deep commitment to quality and safety of its products. We’ve been selling our Crispy Fruit products for over eight years and we can say proudly that we have no quality complaints about our products. We have vigorous quality control systems in place to make sure that every product we sell meets our high quality standards. We start with top-quality fresh fruit, sourced from certified, carefully selected growers who undergo a stringent audit review process. Qualified fruit is subsequently processed and freeze dried in facilities that are U.S. FDA-registered, internationally-certified (HACCP Certified) according to the strict quality standards. Our products have not only passed the quality controls in China but, more importantly, they are routinely tested independently by the FDA or FDA certified labs in the U.S. This allows us to respond firmly to specific questions from our customers on product additives (there are none) and any concerns about ingredients. When we test our products, the lab results confirm that our product is in compliance with the FDA specifications. To demonstrate our commitment, we have a trained professional on our team to addresses Food Quality & Safety and monitors our compliance with the latest FDA standards and requirements. And this might surprise you – the main reason we produce our products in China is because of the quality. China is the world’s leading freeze-dried fruits and vegetables producer and it produces some of highest quality products in this category. Many US food companies purchase freeze-dried fruit from China including a large percent of freeze-dried fruit commonly used in the breakfast cereals sold in the US. Often, consumers are unaware of this because there is no requirement for the cereal manufacturers to declare the source of each ingredient. In addition, our CEO travels to China at least 4 times annually to inspect the manufacturing facilities and ensure they meet the highest standards of quality. Because our Crispy Fruit has only a single ingredient, it makes it easy for us to implement rigorous quality control for our products so customers can feel confident about exactly what they are consuming.